Road closures were put in place today on the approach road to Fort George after a member of the public stumbled upon what is believed to be unexploded ordnance. The discovery was made around 11.40am, with police officers attending to put a cordon in place at the scene, located on the B9006 road between the military barracks and Ardersier. The item, believed to be historic, was discovered yesterday close to the wastewater treatment works on the route. Specialists from the Royal Navy Explosive Ordnance Disposal team were tasked to the scene to carry out inspections, however, after a short survey of the item, experts determined the item had already previously exploded, resulting in no further action. Around 4pm, officers changed the parameters of the cordon, allowing the road to reopen to members of the public. Police said: “The device is believed to be historic and a cordon was put in place as a precaution. Elsewhere, a similar incident took place near Nairn. A police spokeswoman said: “We received a call at 9.55am to reports of suspected ordnance found in Nairn at East Beach. 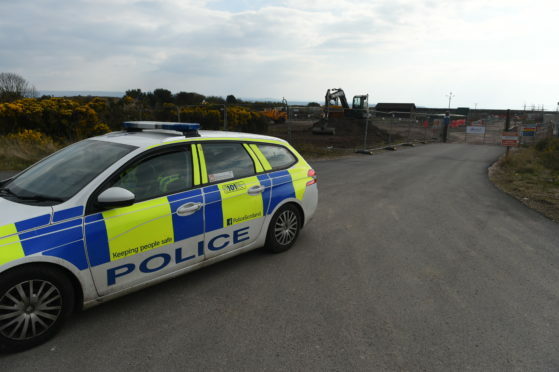 “Our officers put a cordon in place as a precaution and have been manning the site.